The NOOK tablet’s back has two important bits of business. 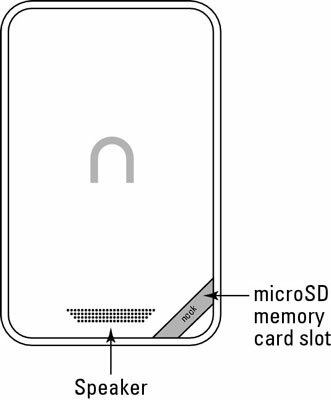 The back panel of the NOOK Tablet is the source of sound and expanded memory. Near the USB port is a small speaker. Don’t expect the sound quality (or volume) to rival your stereo system. The audio is good enough to hear system notification tones and — with a bit of effort — music or audio. But if you plan to groove to some of your personal tunes, buy earbuds and plug them into the outlet at the top end. If you want to share the sound with someone, you can buy a splitter that allows two devices to plug into the same jack. If you’re going to be listening to music or speech, it may help if you do not lay the tablet flat on its back; to get the best sound, the speaker should not be covered. 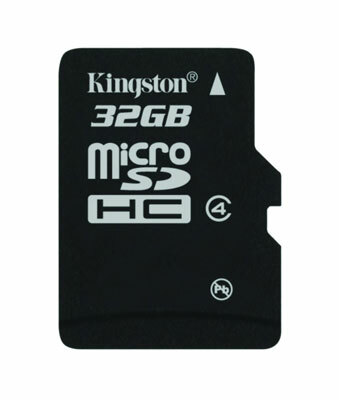 This tiny opening can accept a little sliver of electronic flash memory (called a microSD or microSDHC card) as large as 32GB. This card holds information that is in addition to your tablet’s built-in memory. And though 32GB is a whole lot of room, if you fill up one card, simply remove it and install a new card.